RALPH H. ABRAHAM has been Professor of Mathematics at the University of California at Santa Cruz since 1968. He received the Ph.D. in Mathematics at the University of Michigan in 1960, and taught at Berkeley, Columbia, and Princeton before moving to Santa Cruz. He has held visiting positions in Amsterdam, Paris, Warwick, Barcelona, Basel, and Florence, and is the author of more than 20 texts, including eight books currently in print. He has been active on the research frontier of dynamics — in mathematics since 1960, and in applications and experiments since 1973. He has been a consultant on chaos theory and its applications in numerous fields (medical physiology, ecology, mathematical economics, psychotherapy, etc.) and is an active editor for the technical journals World Futures, and the International Journal of Bifurcations and Chaos. In 1975, he founded the Visual Mathematics Project at the University of California at Santa Cruz, which became the Visual Math Institute in 1990, with its popular World Wide Web site since early 1994. 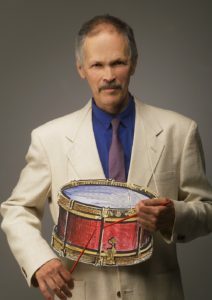 He has performed works of visual and aural mathematics and music (with Ami Radunskaya and Peter Broadwell) since 1992. Tandy began her career at age 16 touring world-wide with Alwin Nikolais Dance Theatre, performing off-Broadway, appearing as a guest with Atlanta Ballet, Momix, Remy Charlip, Murray Louis, Oakland Ballet, Carolyn Carlson in France and Bobby McFerrin, with whom she has worked for over 30 years. She has made 100+ works for her own company touring 4 continents. In 2014, she premiered a new show for Ririe-Woodbury Dance Company in Salt Lake City. Her off-the-map career has led her to opera, circus, music videos, corporate events, solo shows, animation, horse spectacles, commercials, and fundraising extravaganzas. 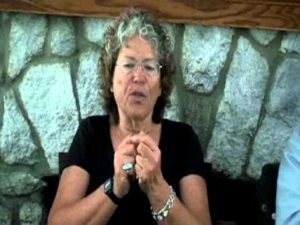 A woman of diverse theatrical talent and expertise, Tandy served as Artistic Director for the Moscow Circus in Japan for 2 years and for the Pickle Family Circus for 10 years. 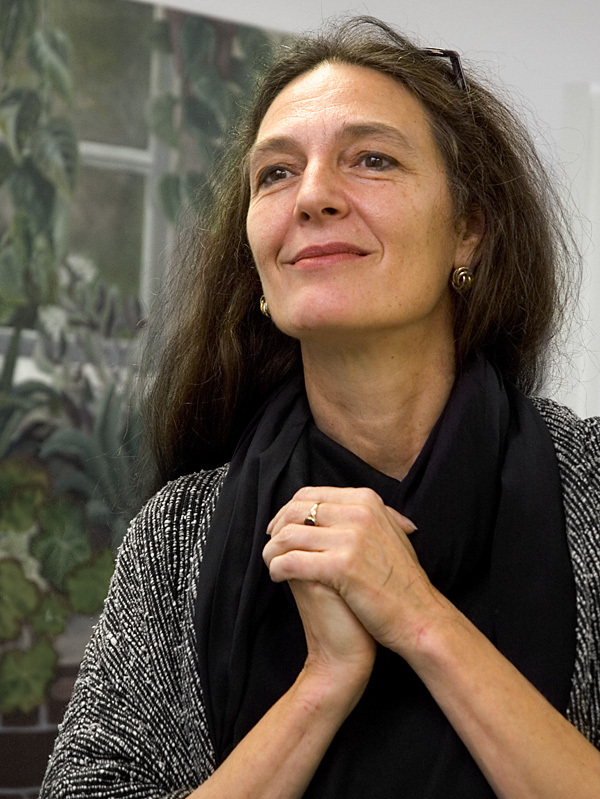 Tandy has worked with many composers, including Art Lande, Lou Harrison, John Adams, SoVoSó and for 40 astonishing years with her co-conspirator, Jon Scoville. She was the choreographer for Tim Burton’s The Nightmare Before Christmas, MTV and the Emmy award-winning PBS special, Voice/Dance. 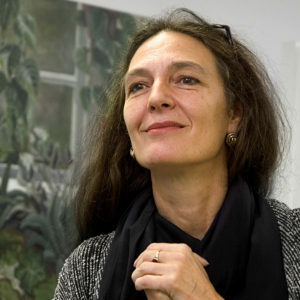 She received awards from the American Film Institute to make a film on Hildegard von Bingen, and the San Francisco Museum of Performance and Design chose Beal for their video project Four Dance Icons of the West. 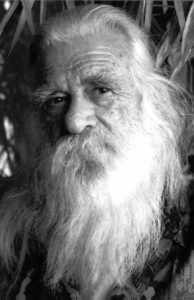 Peter Arnon Demma co-owned The Hip Pocket Bookstore. 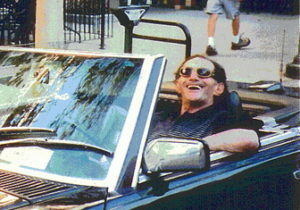 A friend of the Merry Pranksters, Demma first started visiting Santa Cruz with Neal Cassady. He passed August 28, 2015 at the age of 78. Founders of the Catalyst Coffee House and Delicatessen that was established in the old Saint George Hotel in 1966. “It was a magical place where “town and gown” could meet and socialize. 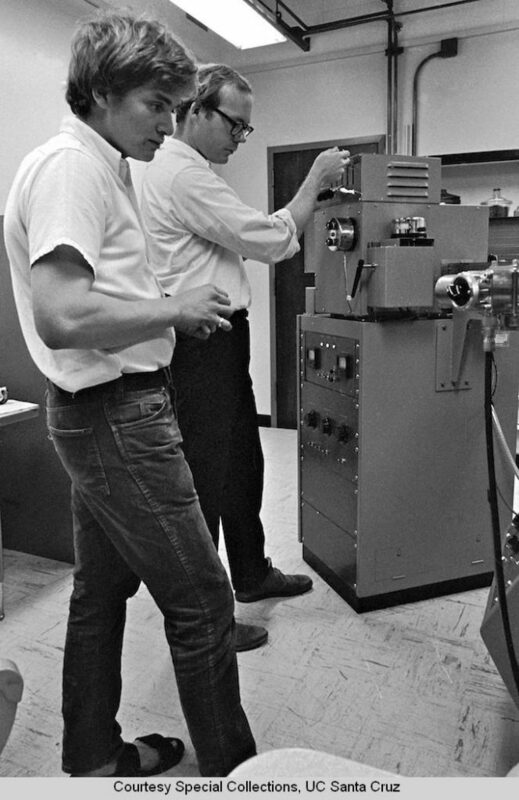 That was the purpose of this enterprise started in 1966 when the University was new. 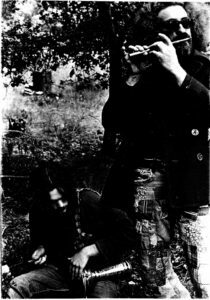 Al and Patti DiLudovico, U.C.S.C. Administrator Bryan Stockey and Santa Cruz community leaders financed the opening by selling shares to faculty members and city citizens. The Coffee house more than served this purpose as a gathering place for students, faculty members, musicians, authors, politicians and local residents. 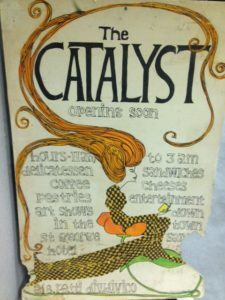 Patti chose the name the Catalyst and drew on her background as a folk singer to create a relaxed welcoming atmosphere, featuring 25 cent mugs of coffee and delicatessen sandwiches for 75 cents served at tables around the fountain in the many windowed garden room. For the past thirteen years I have been swimming with and photographing the North Atlantic humpback whales which calve in the warm waters of the Silver Bank Marine Mammal Sanctuary. These whales mesmerize me with their curiosity and willingness to hang out with members of our species even though we still hunt them. In 2015 I look forward to swimming with and photographing the antics of these social humpback whales again. Robert Schoeneman Hall, a fourth-generation Californian and long-time resident of Santa Cruz passed away July 27, 2009 at the age of 86. Born in San Francisco, eldest son to M.C. and Mayre R. Hall, Bob also lived in Carmel and Watsonville. He attended Mintie White School in Watsonville and Santa Cruz High. He completed high school at New Mexico Military Institute in Roswell. 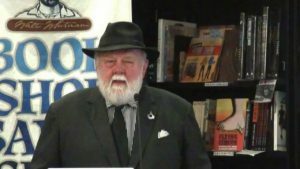 He was a member of Boy Scout troops in Carmel and at Wilder Ranch, and a regular visitor to Yosemite’s Camp Curry and the Santa Cruz Beach Boardwalk, both sites where his father served as publicity director. Bob traveled with his family to many State and National Parks and passed a love of adventure and the natural world on to his children. After the attack on Pearl Harbor, Bob interrupted his studies at San Jose State when he volunteered for the U.S. Army infantry. He spent World War II under General McArthur in the Philippines and Japan. At the end of his service he returned to San Jose State College and later joined father and brother Charles at M.C. Hall and Sons Realty in Santa Cruz’s Compass Rose building on Pacific Ave. In 1952 he married and had four children with Marion Samuels. He remained very active in local and national political organizations including Jr. Chamber of Commerce, Miss California Pageant, the United Nations, UNICEF and the Democratic Party. He founded the first local UN chapter. Bob stayed current with events and issues: international peace, civil rights, free speech and social justice. He was active in the Vietnam Friendship Village Project; a regular participant at the Free and later Penny Universities; and City Council and Board of Supervisors’ meetings. He served as adjutant/historian at the Bill Motto VFW Post. 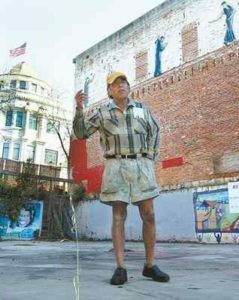 Bob Hall was a long-time familiar figure on the Pacific Garden Mall, inspiring local columnist Bruce Bratton to dub him a “walking icon.” In recent years he lived at La Posada on Frederick Street, enjoying the company of long-time acquaintances and new friends. Bob enjoyed reading, studying local and political history and writing essays and letters, poetry, and prose vignettes of his family history. He was a regular contributor of Letters to the Editor to the Santa Cruz Sentinel. Max Hartstein is well known locally as the founder of the 25th Century Jazz Ensemble and as an accomplished visual artist. His musical career has included stints with Dexter Gordon, Dizzy Gillespie, Bud Shank, Bud Powell and Zoot Sims. 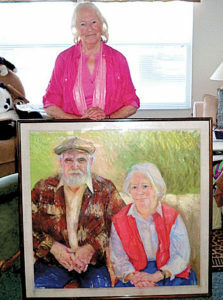 Hartstein’s drawings illustrate the poster for the Naptown Reunion, and an exhibit of his work will be on display at the Kuumbwa Jazz Center during the performance. In 1966, Sharon and Ron Lau founded Bookshop Santa Cruz. Paul Lee, a distinguished professor from University of California Santa Cruz, founded the organic garden at the University with Alan Chadwick. I have been in private practice as a clinical hypnotherapist for over 25 years. Concurrently, I’ve taught the “direct suggestion” method of hypnotherapy and have lectured extensively on the influence of the mind-body interaction on one’s health. My focus is on issues of fear, anxiety, pain management and trauma. For the past decade I’ve worked with people who are seriously ill, particularly those who have been given a frightening medical diagnosis. I aid them in redirecting their attention away from self-defeating thoughts and toward their innate strengths. My interest in this area led me to establish Synoptics Research, LLC, a biomedical animation company. As part of Synoptics’ mission, I designed a five-time award winning DVD: “Guided Visualization: working with the healing power of your immune system” was created to offset the overwhelming fear people typically experience when confronted with serious illness. It is a blend of relaxation, education, and emotional support. It’s in widespread distribution in hospitals, nursing schools, cancer clinics and individual homes throughout the country. When I was growing up, if you didn’t go to college and didn’t have an education, you were like cannon fodder. The military made me realize that they wanted me to kill somebody. It was all going in that direction and when you’re 17, you think that’s how it is. When I got out of the Marine Corps I got a degree in sculpture. At the same time I got my degree in design; I thought, I don’t want to design for industry, I don’t feel like being known for the best electric razor and toothbrush. So I went into art. I went to Mexico and got my M.F.A in painted sculpture. You know what I realized through art? It develops your intuition – to be in the right place at the right time, to go down the road and realize, that I should go this way or that. How did you arrive in Haight Ashbury? It was 1967, I was working on a show for a museum; and it was going to be 3 storeys of painting and sculpture. It was the Triumph Museum of Art which has now become very important. And the director was Lydia Modivatelli. 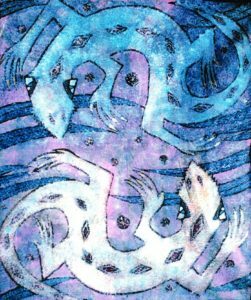 She named the show – Psychedelic Art. They said my art was psychedelic. For me it was colourful, my mother used to knot hats like that and she wasn’t psychedelic! A man with Ken Kesey, who was called the ‘Hassler’ was helping me to take this show over to the Triumph Museum. He said there is going to be this big thing happening called a ‘Love In’ in Golden Gate Park. He said, “You’ve got to go, you got to be there, all these people are going to be there.” It was the first ‘Be In’ right there at the beginning of Haite Ashbury It was beautiful! they rejected this notion of how men should look, they wore beads, they had long hair; this whole feminine side of them could be shown which hadn’t been before. Everybody was like your brother or sister. People were coming down the Big Sur coast-line – hippies hitchhiking. They were trying to change their lives and that was the feel. People were on the road everywhere, sleeping in the Park. You thought there was going to be a dramatic change because there were all these important people, musicians, and people in the Creative Arts, all very powerful. I thought I could also help to make that change too, I wanted to be there. Keith Muscutt is assistant dean of the arts at the University of California, Santa Cruz. 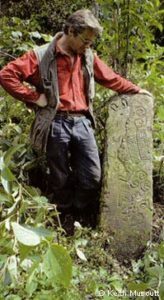 A native of England, he has traveled widely in the United States, Mexico, and Peru, photographing and writing articles about rock art and pre-Columbian remains. He is the founder of the Fundación Benéfica Niños de Chuquibamba, which promotes the health and education of children in the remote Andean village Chachapoyas. sleeping out under the night sky each summer, studies in electronic composition with Gordon Mumma and Vladimir Ussachevsky, Latin music with Michael Spiro, Dennis Broughton, and Edu Szjanbrum, plus tours as road manager for performing arts groups from Calcutta, Kerala, Djakarta, Denpasar, and Seoul. He has taught and accompanied in the U.S., Europe, South America, and Asia. Over fifty of his scores have been commissioned by numerous choreographers and dance companies including the Alwin Nikolais Dance Theater, Murray Louis Dance Company, Tran Chan of Brazil, Laura Dean, Sara Rudner, the Oakland Ballet, the Høvik Ballet of Oslo, Compagnie Hors Taxes of Paris, the Ririe-Woodbury Dance Company of Salt Lake City, and Tandy Beal and Company. He has written music for a commercial for the Digital Equipment Corporation, and he created sound installations for the Seibu Department Store in Tokyo, a gallery in São Paulo, and with visual artists Ellen Bromberg, Carleen Jiménez, and Bruce Lee at sites in California and Utah. Radio appearances include Radio Belgrade and Radio Free Europe as well as a work on National Public Radio. Jon Scoville is a recipient of a California Arts Council Composer’s Fellowship and grants from the Salt Lake Arts Commission and Cultural Council of Santa Cruz County. He is Co-Artistic Director of Tandy Beal and Company, on the dance faculty at the University of Utah, and co-author of Sound Designs — a book about the design and construction of musical instruments. If he hadn’t met his latest wife, Tandy, 40 years ago, he’d be playing guitar in a Country and Western band in Nashville and voting republican. Despite its reputation as a natural wildlife preserve for 1960s-style hippies and similarly free-spirited lifestyle rebels, Santa Cruz County was once, in fact, a quiet, conservative, decidedly un-hip place. If anyone were ever to draw up a list of those most responsible for turning Santa Cruz from the latter to the former, among the top five names would certainly be Leon Tabory. Tabory, who died in September a week before turning 84, will be remembered at a memorial service on Sunday for a life that reads like a grand 20th century novel. But in the cultural history of the county, Tabory stands, for good or ill, as a pioneer in establishing the ’60s counterculture in this area. He brought in the Day-Glo colors where once had been only red, white and blue. For a few crucial years in the mid-1960s, Tabory was the owner/operator of The Barn, a landmark off Highway 17 in Scotts Valley that, for a brief moment, was the local epicenter of the flower-power movement. In the middle of tranquil, bucolic Scotts Valley, Tabory attracted droves of young longhairs where few had been seen before. A psychologist by training, Tabory presided over a vibrant weekend scene that featured some of the earliest rock light shows as well as live musical acts including such iconic figures as Janis Joplin and Country Joe &amp; the Fish. 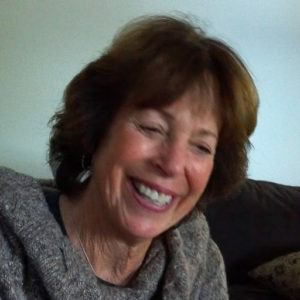 Writer, painter, former San Francisco cop and Cabrillo College English teacher.